Dec 30, 2016: Quick question, don't upvote. 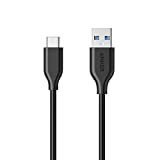 Spare USB c cable advice? Mar 28, 2017: 45 degree stands for JoyCon Channels. Mar 30, 2017: Thoughts on this battery pack/USB Cable with switch? Apr 17, 2017: I wrote to Anker support to ask about the compatibility of their Powerline+ USB C to USB 3.0 cables. Here is their reply. May 11, 2017: I've tried a few different car chargers from Amazon, none of them show that they're fast charging the phone. Help? Dec 23, 2017: Are all USB C cables the same speed?